Now that we looked at it from a purely physical perspective, I would like to focus on hara from a psychological standpoint. In so doing, I want to shift from what hara is to why it is worthwhile to develop it in the first place. To begin this discussion, it is helpful to look at the importance of the term in Japanese language and culture. 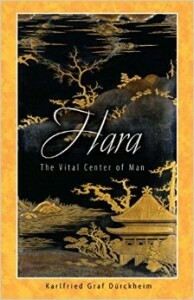 The seminal work on hara in English, and, probably anywhere in the West, is the book, Hara: The Vital Centre of Man, by Karlfried Graf Von Durckheim, which I mentioned in passing in an earlier post. Von Durkheim was a German psychologist who became fascinated with the subject while living in Japan. The book was first published in German in 1956; the English translation in 1962. It has a remarkable chapter on the uses of hara in the Japanese language. In it, he discusses sayings that involve hara. At least some of these have been quoted in virtually every book on hara that has since appeared in English. The sayings provide excellent windows into the psychological significance of hara. While I describe some below, I strongly suggest reading the book. This expression literally means “The person with a big hara”. In Von Durkheim’s words, it conveys that that he or she is “generous, magnanimous and warm-hearted without any implication of weakness or indulgence.” It is similar to saying English that someone has a “big heart”, except the locus of the generosity, obviously, is seen as emanating from a different part of the body. This expression means that a person has “finished” or “accomplished” his or her hara. It connotes maturity; a maturity that comes from years of training. A related saying, hara no dekita inai hito wa hito no ue ni tatsu koto ga dekinai, is translated by Von Durkheim as “the man who has not finished his belly cannot stand above others (is not fit for leadership).” On the other hand, the saying hara no dekita inai hito refers to the person who has not finished his hara training; it conveys the idea that he or she is not developed or immature. I first read Von Durkheim’s book shortly after I began my Zen training in 1977. This was before I had the initial discovery of my hara, which I wrote about in the first post. As a psychologist, I found it interesting that another culture viewed emotions, emotional control and maturity as emanating from different parts of the body than we do in the West (the head and/or the heart). But I viewed these sayings as being metaphoric. Just as we in the West don’t really think someone actually “loses” his or head when they get angry, I assumed that the Japanese were not really saying that someone’s belly really changes when they lose their temper. However, as I progressed in my Zen training I began to understand that these sayings should be taken literally, that with the development of the physical aspects of hara comes profound psychological changes. This was most clear to me as I observed my Zen students, particularly those who started training around the same time as I. As they developed hara physically, they acquired composure, equanimity and a sense of gravitas that had not been there before. And, I learned that one’s hara does actually rise when they “lose it”. Two related incidents from my past made this clear to me. Early in my career as a psychologist—and early in my Zen training– I had to testify in court as an expert witness regarding an evaluation I had conducted. This was my first time in court and I had considerable anxiety about it. But, as a Zen student, I thought that I would be able to control it if I just kept my hara set while on the witness stand. It turned out that the opposing attorney came out swinging. He first attempted to impeach my credentials, almost yelling that I was not experienced enough to testify. Immediately, my hara “rose”. He then proceeded to rake me over the coals for what seemed like hours. No matter how hard I tried, I could not set my hara. My breathing was labored and stayed in my chest. I became flustered; sweat beaded on my forehead. And the harder I tried to set my hara the worse I became. I left the courtroom vowing that I would never testify again unless ordered to by a judge. And I felt discouraged that my Zen training did not allow me to retain better composure. I did not keep my vow to never testify again and, some years later, I found myself on the stand facing a hostile attorney. This time, I was able to keep my hara set. No matter what the attorney threw at me, it remained set and my breath stayed slow and deep. And, there was a noticeable change in composure; I remained calm and focused throughout. I am convinced that it was control of my breathing and posture that allowed that to happen. 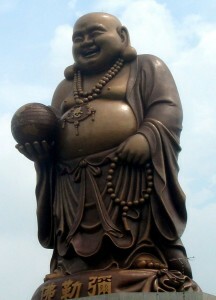 Many Westerners are probably familiar with statues of Hotei (Budai in Chinese). He is a bald headed, robed monk with an enormous, exposed belly, carrying a sack in one hand and jizu (beads) in the other. There are often statues of him in restaurants and people sometimes rub his belly for good luck (or maybe just for the tactile pleasure of it). Sometimes called the “Laughing Buddha”, Hotei is seen as figure of abundance, a person who brings bounty and joy to all. In Zen training, we will sometimes refer to someone with overflowing generosity and good cheer as a “real Hotei”. It is no coincidence that Hotei is depicted as having an exaggerated hara, as Japanese implicitly understand that that his bountiful personality and infectious good cheer comes from his hara. And, no, you don’t have to look like you have a beer belly to have hara. His lower abdomen is prominent not from fat, but from the development of his hara. While in the West we clearly have the concept of character development, it tends to be disembodied. The lesson I have learned from Zen training is that there is a physical dimension to character development that is intimately bound to breathing and posture, in other words, to hara development and, I believe, this idea is sorely lacking in our culture. In the next post, I will continue to discuss the why of hara development by discussing hara from the spiritual perspective.